WBEZ blogger alum Mark Bazer hosts the first Interview Show of the new year with very special guest, Moto and iNG chef/owner Homaro Cantu, at the Hideout. Cantu&apos;s book, The Miracle Berry Diet Cookbook, has just been released, a project nearly a decade in the making. The so-called miracle berry grows wild in West Africa and transforms flavors, most notably, sour to sweet. Cantu will offer a miracle berry tasting at the show. He&apos;s also teaching a miracle berry cooking class, with a six course "flavor tripping" tasting menu at iNG until Jan. 12, which includes a copy of the book. Admission $8 to the Interview Show; $100 for the miracle berry class. 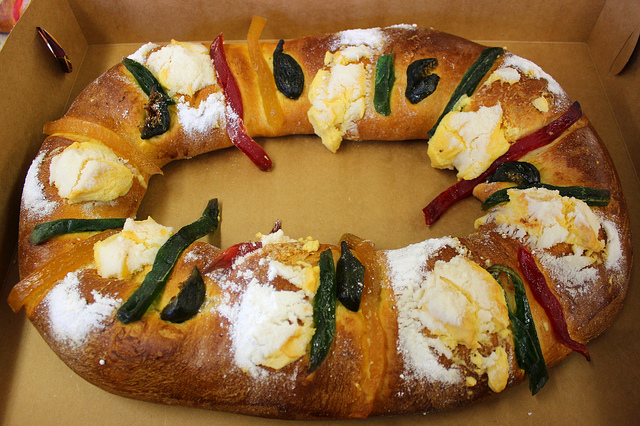 Celebrate Epiphany, also known as Día de Reyes, with a French galette des rois or Mexican rosca de reyes from bakeries across Chicagoland, including Floriole Cafe & Bakery and all four Bombon locations. Remember to look for the favor inside. Slow Food Chicago presents the Quarterly Canning Workshop, featuring sparkling wine and lavender jelly, at Kendall College. Scratch Homemade founder Lis David will teach the small-batch hands-on class using regionally-produced sparkling wine and locally-grown lavender. You&apos;ll leave with the knowledge and confidence needed to can at home and a few jars of jelly. Admission $45. Soup & Bread presents this week&apos;s theme — the Four Cs: Cumin, coriander, cardamom, cilantro — at the Hideout, this week benefitting Inspiration Corporation. Publican Quality Meats donates bread throughout the season, plus gluten-free loaves courtesy of Rae Lynn Hill, The Sweet Purveyor. Admission FREE, donate what you can and remember Everyone LOVES the Generous.